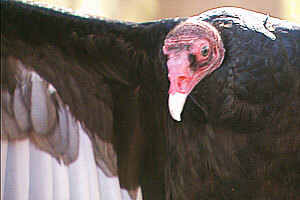 Arriving at the Lindsay Wildlife Museum, one of the first things you see is actually outside – the Turkey vulture. Now, a vulture isn’t what typically comes to mind for making a good first impression. But this bird is absolutely gorgeous, and unbelievably interesting; we instantly fell in love. When most people hear vulture, they think of a big ugly bird found in the desert, waiting for something to die, circling, circling… In reality, the Turkey Vulture is a local species, and is one of the more common birds we see soaring the skies of the Bay Area. While we interviewed Dawn Manning about the Turkey Vulture, there were quite a few “colorful” facts we learned: The Turkey Vulture has no vocal organs – they can only grunt or hiss, although they usually stay silent. They do not build nests – they lay their eggs directly on the ground in caves, crevices, burrows, hollow logs, under fallen trees, or even in abandoned buildings. While they have few natural predators, their main form of defense is vomiting. The foul smelling substance deters most creatures, and will also sting if the offending animal is close enough to get it on them. Luckily, this pretty lady didn’t seem to mind the camera and all the people; I might even go as far as saying she enjoyed the attention. You never know… yesterday, a wildlife ambassador; today, a star on QUEST; tomorrow, a Hollywood superstar? ?